A simple piece of pan seared chicken is elevated by the addition of a quick pan sauce. 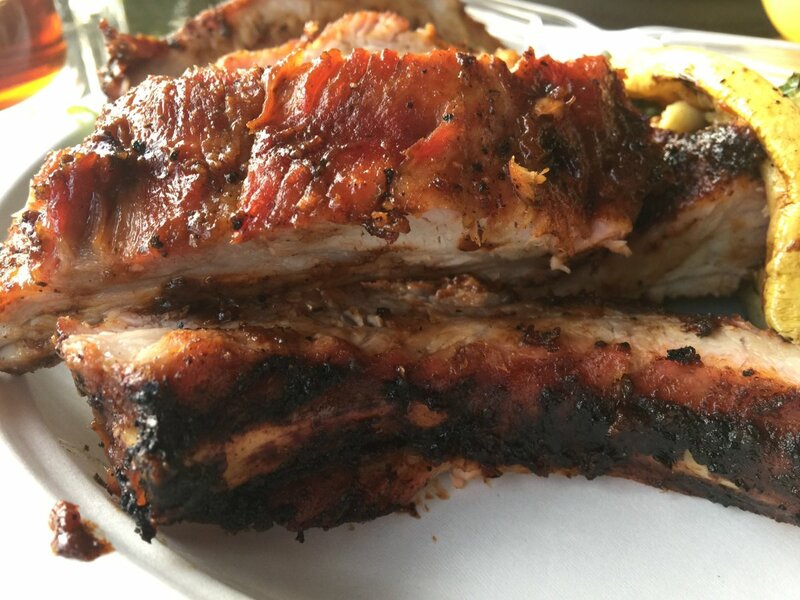 A plain piece of protein becomes restaurant quality with a few simple steps. 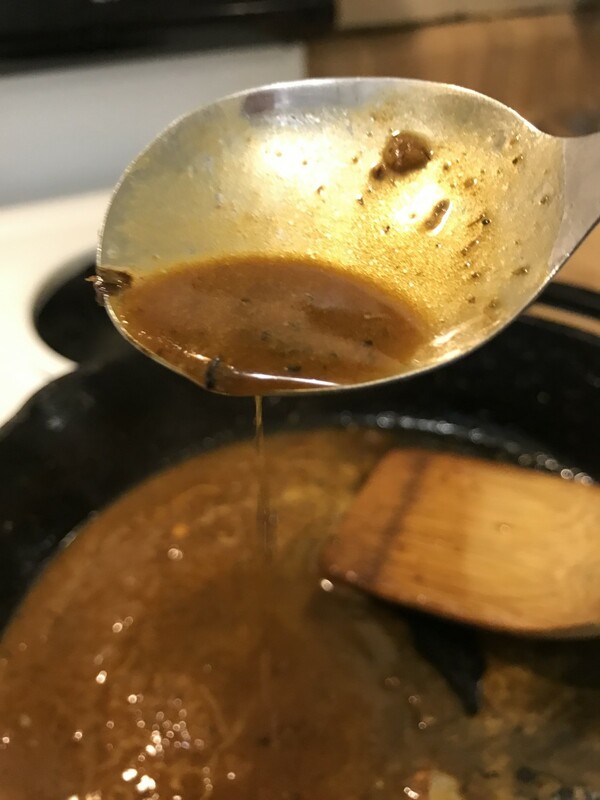 Making a pan sauce is an extremely simple technique that uses only a few ingredients, yet yields some incredibly delicious results. After searing chicken breasts, pork chops, steaks, or fish, all that's needed is a bit of liquid, some herbs, and a few pats of butter. While the meat rests, the sauce comes together, and a pan sauce can elevate a very simply seared protein to restaurant-quality food. Try it yourself; I guarantee you'll love the results. What is a pan sauce, anyway? This is one of those situations where the foodie craze of the past decade has rather muddied the waters. A pan sauce is exactly what it sounds like, despite how intimidating they may appear on television. 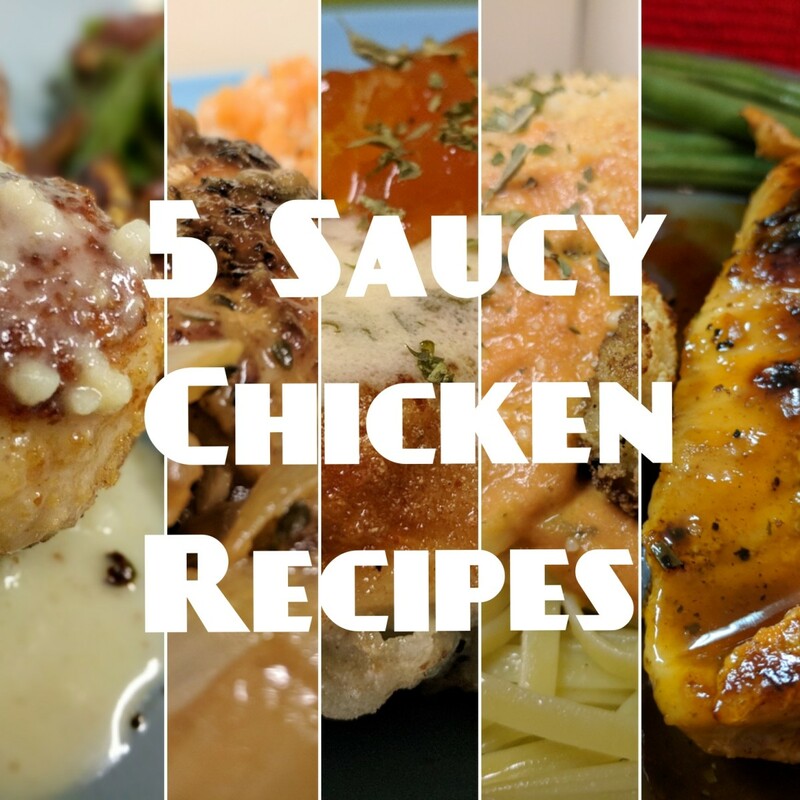 If you haven't already, check out my article on How to Sear a Chicken Breast. I describe the correct way to get a nice, golden, crusty exterior on a piece of chicken. The same technique works for pork, beef and fish, and once you've removed the meat from the skillet, you'll see lots of little brown bits stuck to the bottom of the skillet. Those brown bits are called 'fond' - French for foundation - and they are the foundation for pan sauces. They are culinary gold. The brown bits are absolutely loaded with flavor, and you still have a little bit of oil in the skillet leftover from searing the meat. The oil is also now loaded with flavor, and you additionally have a small amount of liquid from the meat as well. All of these things are going to form the foundation of a simple pan sauce with just a few steps and ingredients. I originate from a family where sauce is viewed as a refreshment. 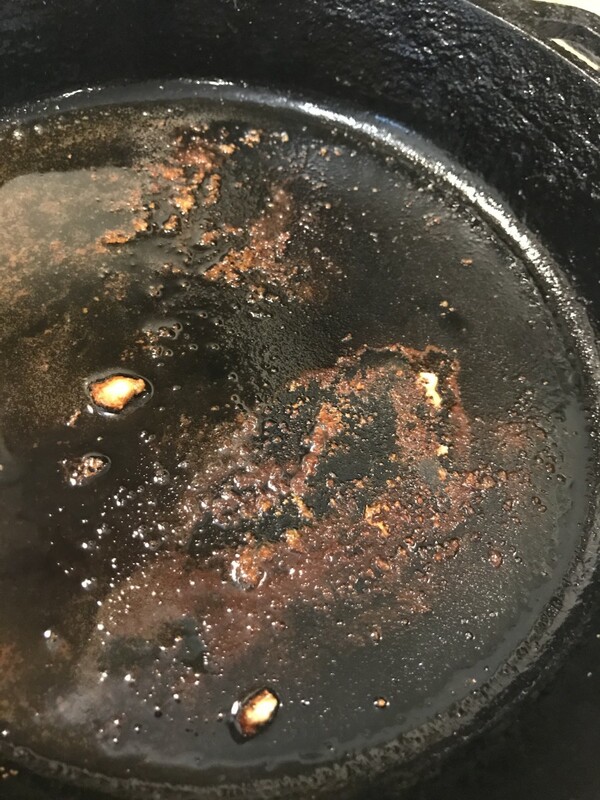 The little brown bits left in the skillet after searing a chicken breast or other protein is called fond, and is the foundation for scrumptious results. There are really only three basic ingredients for a pan sauce, and you can produce an endless variety of dishes simply by varying these. You need a liquid, some type of seasoning and a couple of tablespoons of butter. That's it - I promise. 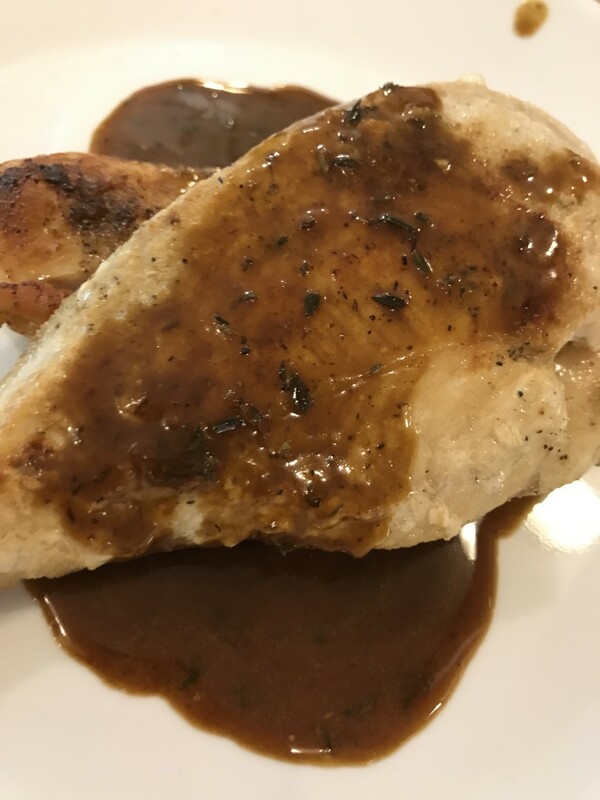 In this article, I made a pan sauce for seared chicken breasts with just white wine, dried thyme, and butter. Of course you always want to taste and adjust your food to your preferences with salt and pepper, but the main ingredients are truly that simple. After you've cooked your protein - your choice - remove the meat from the pan to rest, and place the pan back over medium heat. Add 1/2 cup of liquid for two servings, or double the recipe for additional sauce or more servings. I tend to make a lot of sauce - we love it. In this article, I used a dry white wine, but you can use an almost endless variety of liquids. 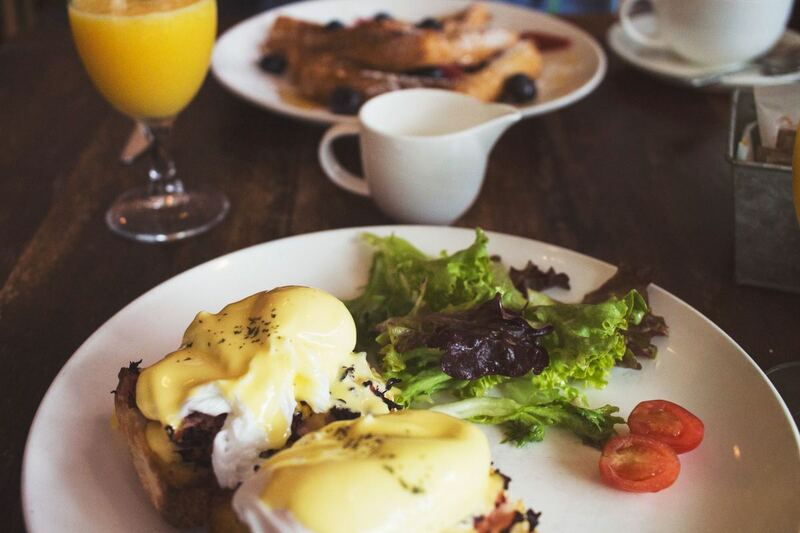 Depending on what you're cooking, you can add beef, chicken or fish broth, red or white wine, lemon, apple or orange juice - or just about anything you want. There are some combinations which are classic - such as the white wine and butter I used here, and it's a great one to start with if this technique is new to you. Once you add the liquid, scrape the bottom of your skillet with a wooden spoon. As the liquid comes up to a boil, the brown bits will release from the bottom and become incorporated into the sauce you're building. These are a gold mine for flavor - so try to get every bit. An additional step I use occasionally is to add minced onions or garlic to the pan. As the vegetables cook, they release liquid, which in turn loosens the fond. This is a great way to get even more flavor into a dish when the sauce is of importance - such as when making Salisbury Steaks. It's not necessary, but it sure works wonders if you want to try it! *Note: The fond should release very easily. Try to stick with wooden spoons so as not to scratch the surface of your skillet. Not so important if you're working with stainless steel, but critical if you have cast iron, or worse - a nonstick pan. I used white wine in this article, although you can use whatever you like. Broth works well, as does apple or lemon or orange juice. 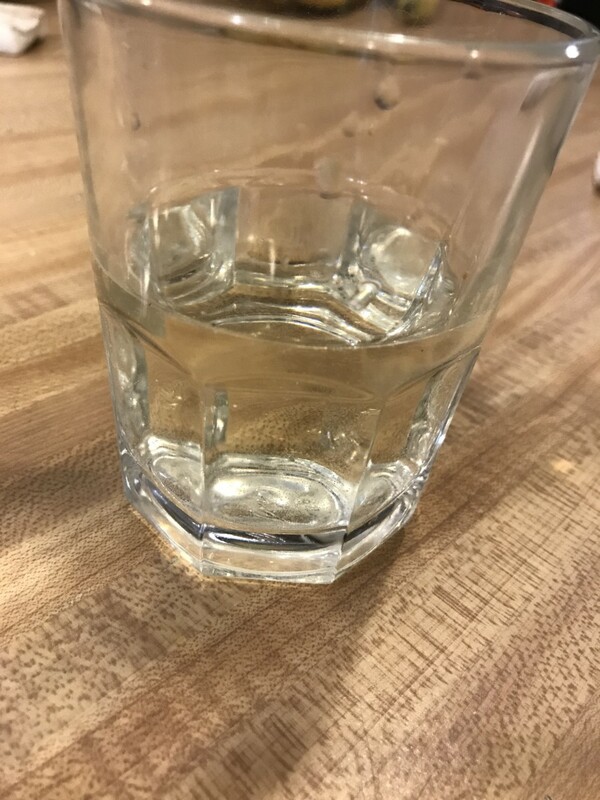 This was an 8 ounce glass and I filled it half full. 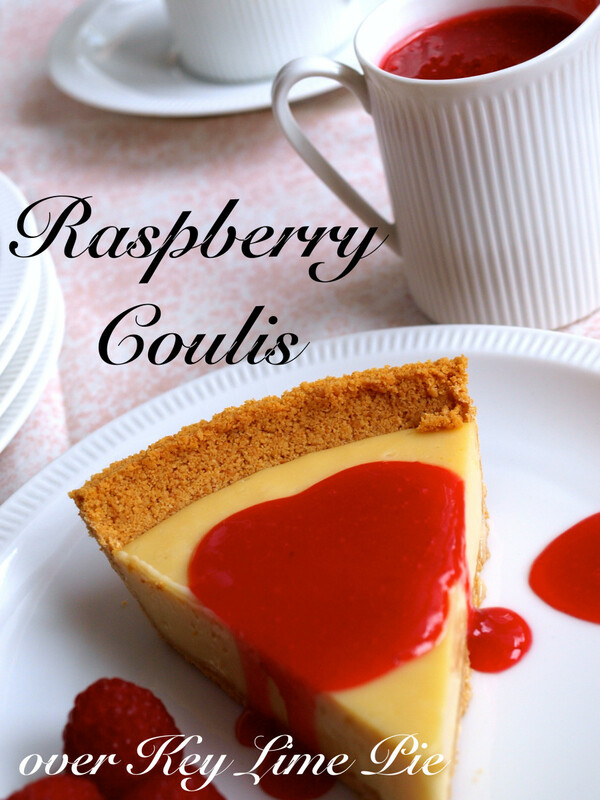 The measurements do NOT have to be exact - this is easy cooking! 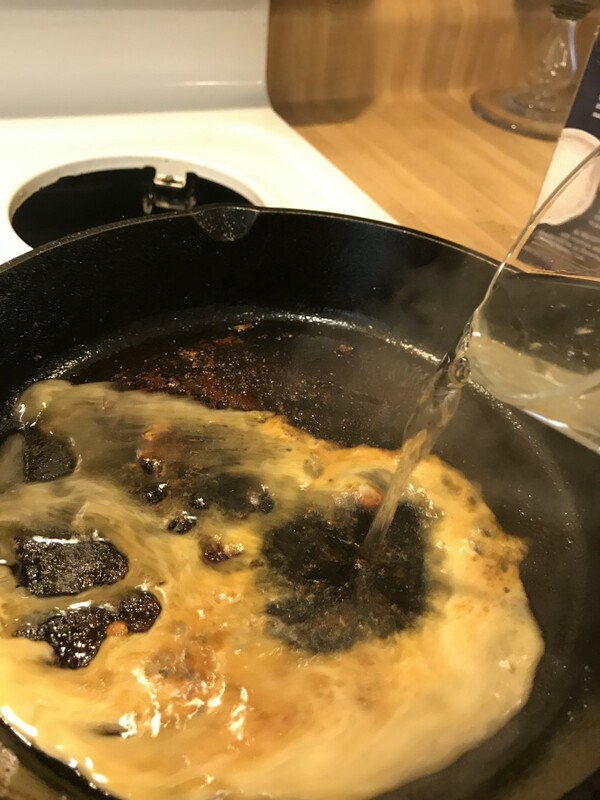 Add liquid to the pan in which you've cooked chicken, pork, beef or fish, and scrape all the brown bits up with a wooden spoon. Once the liquid is simmering, toss in whatever seasonings you'd like. I used about two teaspoons of dried thyme in this article, but I actually prefer a couple of sprigs of fresh thyme. You can add whatever you like - fresh herbs such as oregano, rosemary and thyme are all beautiful. You can take fresh herbs off the stem if you'd like, but often I'll toss them in whole, then just pull them out before serving. The flavors are steeped into the sauce and I skip the step of mincing herbs. 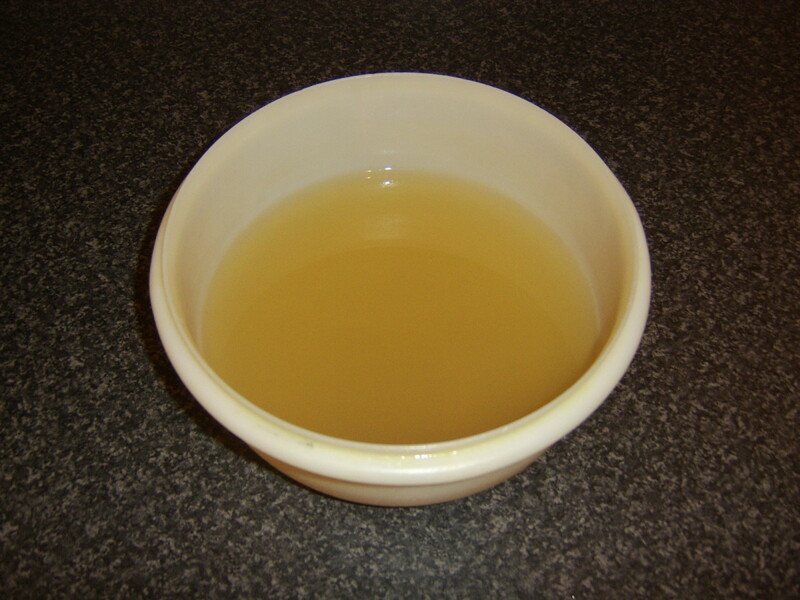 If you have used broth or fruit juice for the liquid of your sauce, this is also when you want to add a bit of acid. A bit of lemon juice or vinegar does a beautiful job and you only need about a teaspoon. Lemon or orange zest should also be added at this second step. You're only about three minutes in, and you're almost done! 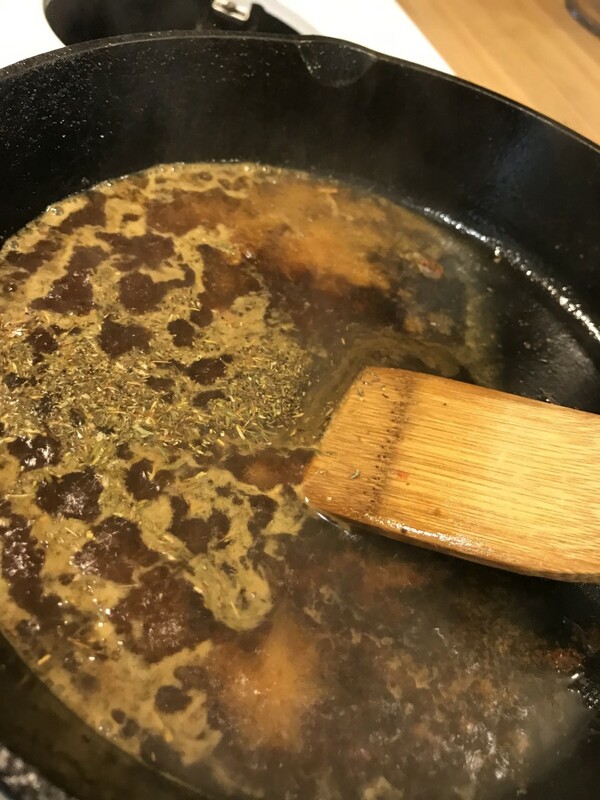 This sauce got a little dried thyme once the liquid had come to a boil and the brown bits were scraped up. You're at the final step! 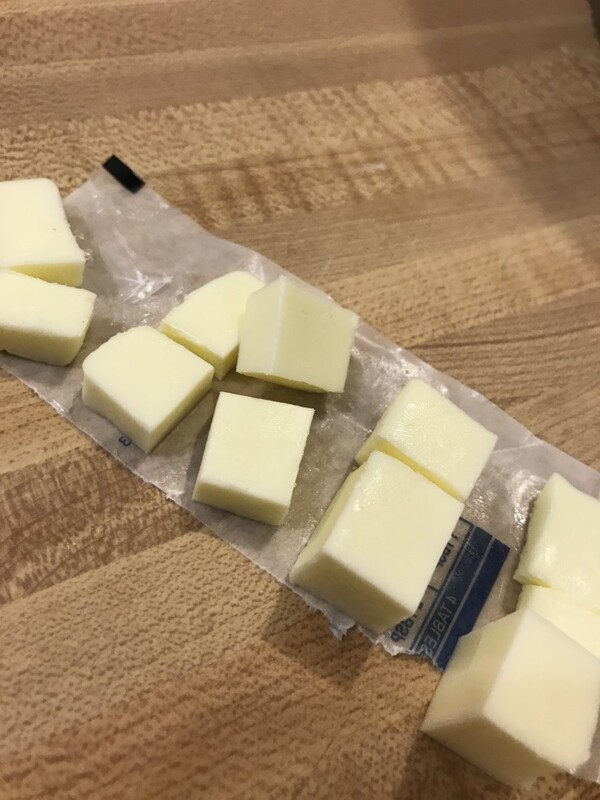 Cut a couple of tablespoons of cold butter into little cubes. While stirring constantly, add the butter, a cube at a time. You're after a quick emulsion - where the fat in the butter combines with the liquid in the sauce. Don't worry too much about that part - just whisk quickly, and add the butter a little at a time. As each little cube melts and is incorporated into the sauce, add another cube until you've added all of it, whisking the entire time. The sauce will thicken just a little bit - that's the emulsion of the butter - but a pan sauce is not very thick. Thick sauces are for rouxs, and this is a different type of sauce. No less delicious - and easier! Cut your butter into cubes, and add it cold into the simmering pan sauce, whisking constantly. All done! Dinner is ready! Once the butter is fully incorporated and the sauce has thickened just slightly, you're ready to serve. You've done it! That's all there is to make a pan sauce. Deglazing the pan with liquid, adding a little seasoning, butter, and whisking. You've just achieved culinary super stardom. 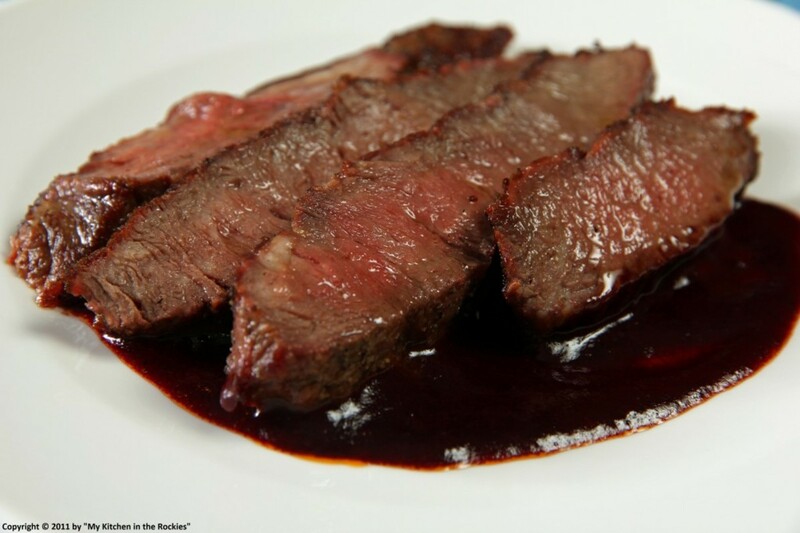 Serve the sauce immediately drizzled over the meat you cooked earlier. It's also wonderful drizzled over potatoes or rice, and of course, my kids love to mop it up with fresh bread. Try this quick and easy technique soon. You'll soon find yourelf cranking out sauces on a regular basis, and you'll be surprised at how much better your simple meals can be. Even better - your family will thank you for it, which is a win in anyone's book! The finished pan sauce is slightly thickened, bursting with flavor and ready to serve. 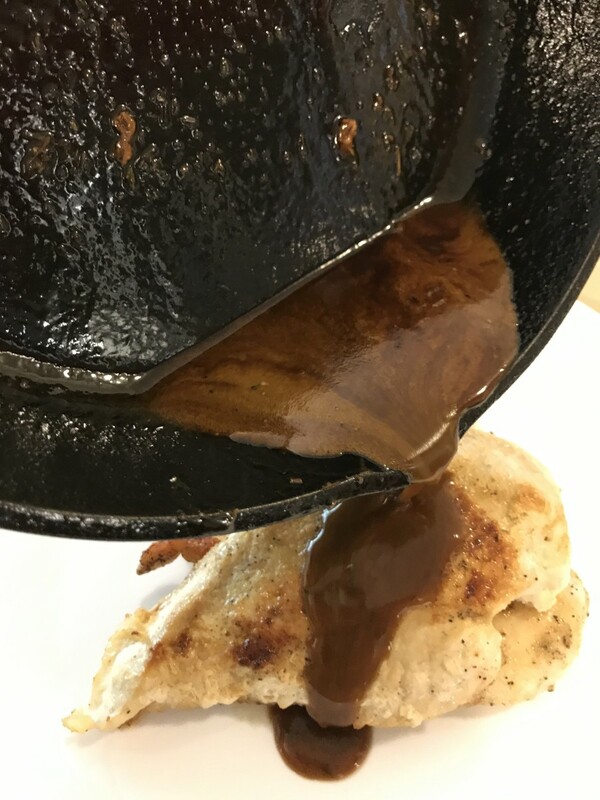 Serve your finished pan sauce by drizzling it over the finished protein - chicken, fish, beef or pork - or over potatoes or rice. This stuff really is incredible! Watch How to Make a Pan Sauce! Thanks y'all! Pan sauces really are that easy - and you'll love the results. Thank you again! Great hub! Pan sauce has always been one of those "fancy" cooking tricks that I thought was way beyond my capabilities, but your hub makes it seem possible (even for me!). Thanks for including the list a suggested liquids and spices for different meats. This is very helpful. Pinning for future use! Hi Jan, This pan sauce is a favorite of mine too. In fact, I'm making with after cooking my steaks on my grill pan tonight. Thanks for sharing.